Ice hockey and Niceville would appear to have little in common. The nicest little city in the South is now known to many National Hockey League teams and players thanks to Jason Livery, a Niceville newcomer who is one of the world’s top designer and painter of hockey goalie masks. 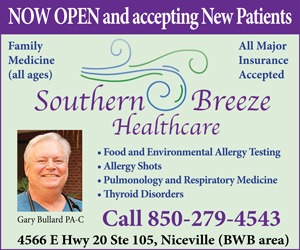 Livery is owner and operator of Head Strong Grafx, a business he runs out of his Niceville home. Here he creates his custom–designed and painted goalie masks for both college and professional hockey players. Jason Livery, of Niceville, applies clear coat to a mask he has painted for Phillip Grubauer, of the Washington Capitals. Ice hockey goalies wear a mask for protection. Some choose to wear a simple, plain mask. Others prefer helmets that are colorful, wild, and flashy. Some designs display emotion, some display humor. Other designs represent personal stories or recognize friends or loved ones. NHL goalies sporting Livery’s custom-made masks include Jake Allen of the St. Louis Blues, Calvin Pickard of the Lake Erie Monsters, Karri Ramo of the Calgary Flames, and Scott Darling of the Chicago Blackhawks. Darling wore a Head Strong Grafax mask when the Blackhawks won the Stanley Cup in June of this year. Other NHL players who have worn Livery’s masks include Jaro Halak, Brian Elliott, Jonas Hiller, Jimmy Howard, Tommy McCullom, Darcy Kuemper, and Ben Bishop. 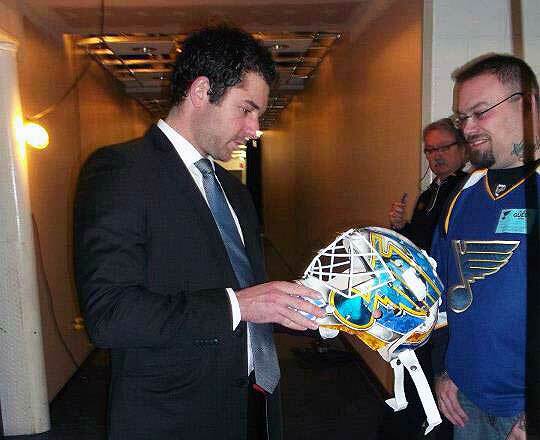 Brian Elliott, of the St. Louis Blues, examines his new mask designed and painted by Jason Livery as Livery looks on. The NHL is only one of the professional ice hockey leagues that look to Livery for his creative skills. 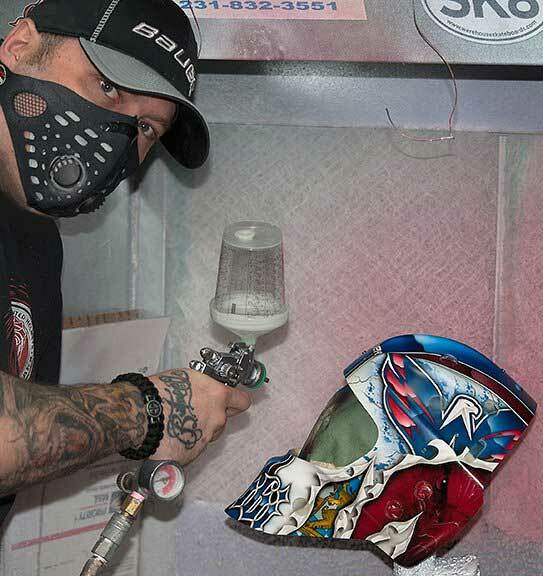 He designs and paints masks for professional teams in Canada and Europe, as well as many NCAA teams. Livery has worked for teams playing in USA Hockey, CHL, ECHL, and AHL. Livery has been a custom painter for more than 25 years. He founded Head Strong Grafx five years ago in St. Louis. His break into the NHL came when he was asked to paint a mask for Brian Elliott, of the St. Louis Blues. Livery said he was contacted by the team after his work caught the attention of a Blues’ equipment assistant who saw players in a youth sports league wearing masks painted by Livery. “I was invited to their training facility to meet with Brian and go over his ideas. While there I talked to the current starting goalie at the time, Jaro Halak. He asked me to do a remembrance piece on the backplate of his mask to honor former friend and teammate, Paval Demitri, who died in a plane crash,” Livery told Niceville.com. “Once I did that backplate, it went viral all over the world and even in the newspaper in Jaro’s and Paval’s native country of Slovakia,” he said. That led to Livery being invited to an equipment show later that year where he become known to several NHL and semi-pro team equipment managers. Now Livery has so many orders from NCAA and professional hockey teams that he no longer designs masks for recreational players. Livery came to live in Niceville after his wife, Christy, a Major in the Air Force, received orders for Eglin Air Force Base. They have lived here since February of this year. Visit Head Strong Grafz website at headstronggrafx.com.